Windsor Hills is a beautiful community located right in the heart of the major attractions in central Florida U.S.A. About 2.5 miles away is a very magical neighbor: Walt Disney World. 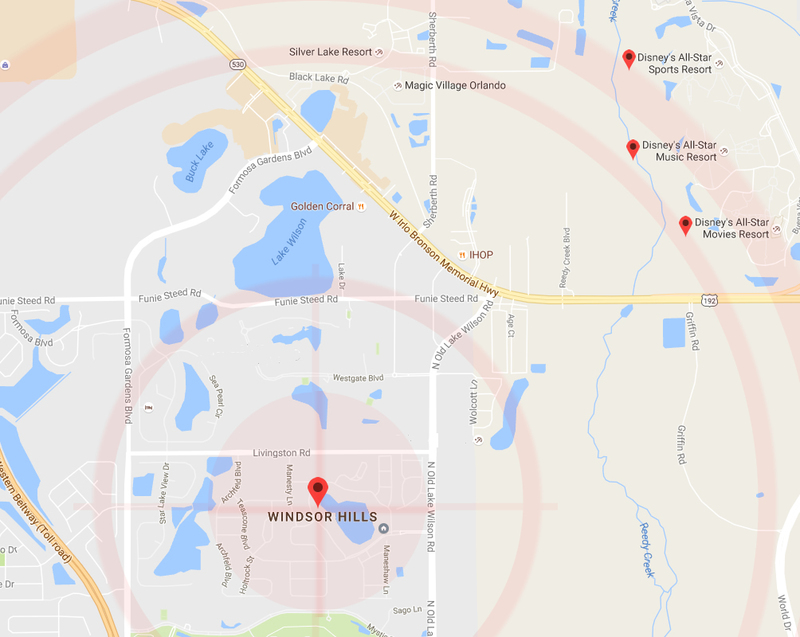 After only a few years of existence, Windsor Hills has become one of, if not THE most highly desired gated vacation rental community in the entire Orlando Kissimmee area, and for excellent reason. Not only is it considered an amenity in itself with it’s 5 star rating and all that is provided for our guests to use, we are perfectly located close to hundreds of shops, restaurants, and local attractions of every kind imaginable. Windsor Hills is the nearest vacation rental community to Disney’s main entrance off US 192 in Kissimmee, and a very short drive away down I-4 are Universal and Sea World. Don’t forget to visit Orlando’s Gatorland which is a classic Florida attraction providing a fun day for all. Two major airports (Orlando and Sanford International) serve the Disney area. Florida’s beautiful beaches on either coast and many state parks are also within an hour’s drive from the community as is Kennedy Space Center. When it comes time to take a break from the theme parks or if you’re not planning to visit one at all, Windsor Hills is the perfect place for family fun and relaxation in the warm Florida sun. It can easily be considered a vacation final destination in it’s own right, and many guests spend their days relaxing and winding down right at their own private and memorable home away from home. Hang out at poolside soaking up the rays. Make your own breakfasts and lunch and save $$$$. Go out to a nice dinner in the evening, or make that at home too because all WH vacation rentals come equipped with complete kitchens and appliances. All condos at Windsor Hills Orlando are within an easy walk to the main clubhouse/pool area and all buildings are equipped with centrally located dual elevators for easy access to the upper levels. For larger parties, Townhomes and Villas are still very close to the community center, but all have their own pools. A Windsor Hills Florida vacation is the perfect and affordable way to get away from the stresses of today’s everyday life. Your beautiful spacious rental home goes way beyond what a cramped hotel room can ever offer. It’s a special fun kind of place that you will actually look forward to returning to again and again.